All things organic and natural are on the rise. Cut stones, agate and water are on trend and will continue to be popular in 2017. Organic shapes and natural formations are easy designs to live with as we are inspired by nature every day. Beautiful color stories and patterns are created in nature everyday from the tops of the highest mountains to the deepest depths of the oceans. So let natures colors and shapes inspire your home interior. Want to know how and where? Try hanging a faux wood panel wallpaper on an accent wall in a den or bedroom; a cut agate wallpaper in a bathroom or put a soothing wave wallpaper pattern in a bedroom to sooth and comfort you. 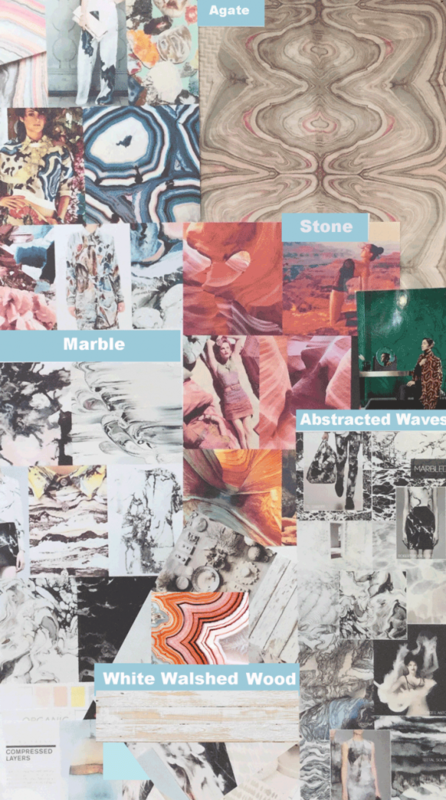 Try any of these marble, stone, wood or water wave patterns to create a soft or bold design statement…its up to you how nature inspires your soul! All boards created by Jaima & Co. An inspirational mood and design trend board. All Copyrights reserved.